As you may know, we have chickens. And a while back we put a few of those chickens (mostly roosters) in our freezer for future eating. Unfortunately when we put those chickens in the freezer we didn't make any notations on the Ziploc bag indicating how old the chicken was at time of slaughter. So when I pull one out of the freezer I never really know how to prepare it; is it a stewing hen or a roasting hen? The other day I pulled out a bag of chicken parts, made a guess about the age of the hen and decided to roast it. I chose incorrectly and the result was nearly impossible to eat being much too tough to chew. I decided to try to salvage the chicken by re-cooking it the next day in the crock pot. 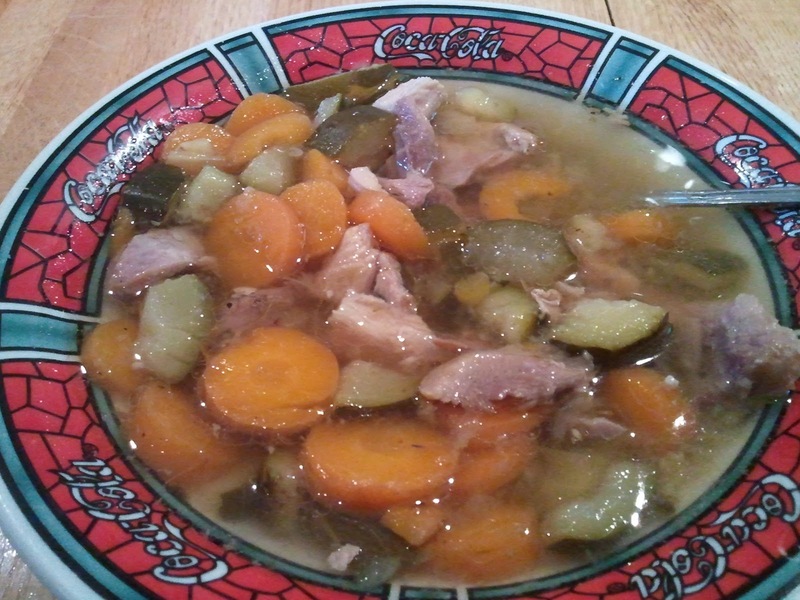 The resulting soup was really good and may become one of my regular meals that uses our own chicken. If you don't have your own home-grown chickens be sure to buy a free range or cage free chicken from the store, organic if possible. The more a chicken moves during its life the more flavor your soup will have. Enjoy! In a slow cooker, place chicken or parts, water and bacon grease. Cook on high for about 3 hours or until chicken is mostly cooked. Remove chicken from slow cooker and cut meat from bones. Return meat to slow cooker then add carrots, zucchini and spices. Cook for another hour on low or until carrots are tender.